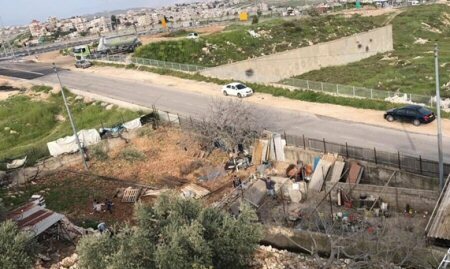 A Palestinian family demolished their own home and certain steel structures, on Friday evening, in the illegal Pisgat Zeev Israeli settlement that is built on Palestinian lands of the Hizma village ,north of occupied Jerusalem, upon order by the Israeli High Court. Family member Youssef Askar said that they began to demolish their structures upon receiving an order by the Israeli High Court allowing them until mid-April to carry out the demolition themselves. The family would be fined by Israel and forced to pay demolition fees, if the demolition is carried out by Israel. Asmar added, according to Ma’an, that Israeli authorities have attempted to seize control over the land on which the family property was built 35 years ago. Israeli authorities reportedly claim that the land was previously confiscated, however, when the family proved ownership in court, they were told that the land belongs to the Custodian of Absentee Property. Askar pointed out that they had built their home out of cement and steel on the 2-dunam land between 1982 and 1985, in addition to a warehouse and a steel structure used for agricultural purposes. Israel rarely grants Palestinians permits to build in East Jerusalem, though the Jerusalem municipality has claimed that, compared to the Jewish population, they receive a disproportionately low number of permit applications from Palestinian communities. For Jewish Israelis in occupied East Jerusalem’s illegal settlements, the planning, marketing, development and infrastructure are funded and executed by the Israeli government. By contrast, in Palestinian neighborhoods, all the burden falls on individual families to contend with a lengthy permit application that can last several years and cost tens of thousands of dollars.